Round about the cauldron go; In the poison'd entrails throw. Toad, that under cold stone Days and nights has thirty-one Swelter'd venom sleeping got, Boil thou first i' the charmed pot. Fillet of a fenny snake, In the cauldron boil and bake; Eye of newt and toe of frog, Wool of bat and tongue of dog, Adder's fork and blind-worm's sting, Lizard's leg and owlet's wing, For a charm of powerful trouble, Like a hell-broth boil and bubble. Scale of dragon, tooth of wolf, Witches' mummy, maw and gulf Of the ravin'd salt-sea shark, Root of hemlock digg'd i' the dark, Liver of blaspheming Jew, Gall of goat, and slips of yew Silver'd in the moon's eclipse, Nose of Turk and Tartar's lips, Finger of birth-strangled babe Ditch-deliver'd by a drab, Make the gruel thick and slab: Add thereto a tiger's chaudron, For the ingredients of our cauldron. How now, you secret, black, and midnight hags! What is't you do? ALL A deed without a name." Last Summer I did a one shot adventure with a group of friends in which I used Astonishing Swordsmen & Sorcerers of Hyperborea 2nd edition & combined it with Shakespeare's play Macbeth. I used witches as NPC manipulators & causers of chaos behind the scenes of an adventure. These witches are twisted demi goddesses in their own right & servants of an ancient goddess of chaos. 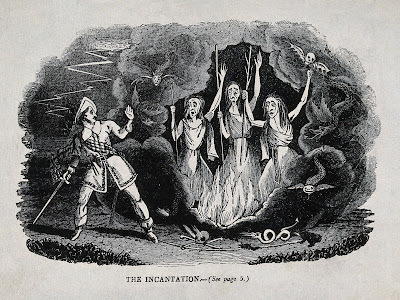 I'm going with the classic definition of these witch sisters as "some nymphs or fairies endued with knowledge of prophecy by their necromantical science" from; " the account of King Duncan in Raphael Holinshed's history of Britain, The Chronicles of England, Scotland, and Ireland (1587). In Holinshed, the future King Macbeth of Scotland and his companion Banquo encounter "three women in strange and wild apparell, resembling creatures of elder world" who hail the men with glowing prophecies and then vanish "immediately out of their sight". 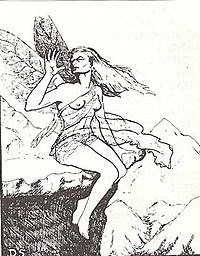 Holinshed observes that "the common opinion was that these women were either the Weird Sisters, that is… the goddesses of destiny, or else some nymphs or fairies endued with knowledge of prophecy by their necromantical science." I'd place them someplace between hags & the classic slyphs out of Advanced Dungeons & Dragons first edition. But not easily defined except that they all share a sort of twisted supernatural intelligence & an ironic sense of humor as they sew the seeds of chaos. While these beings have close ties to the moon goddess of Hyperborea they are wholly independent yet bound to the being once known as Hecate. Their mystery cults of little interests to them while they go about their business of creating & toppling royal lines. Time & space are mere thought constructs to them & the occult runs very strong in their veins. They have all the abilities of a hag & slyph plus they can cast spells as a 6th level witch. Further powers are proved by their dead goddess whose name & power still hold sway even as the cold red sun blots the sky. 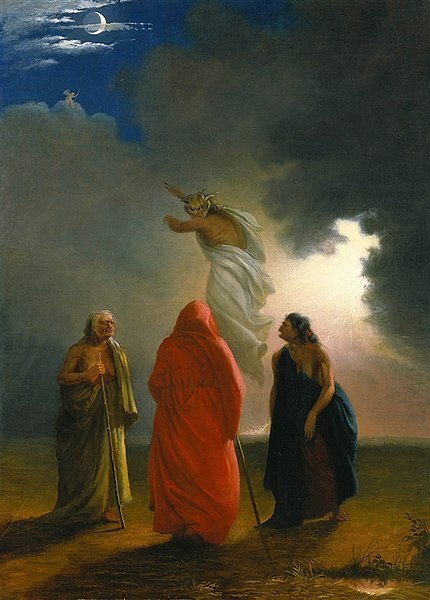 The three witches hold court over their cult in the dead months of Winter when new acolyte witches are presented to them during the sacrificial rites. They see themselves as ironic instruments of destiny & the decree of fate but others see them as twisted representations of chaos of the highest order. There are certain places where those who are found out to follow & worship these entities are beheaded & burned. Witches & clerical followers of these witch sisters are granted a vision each fortnight to insure the maximum amount of chaos can be caused. Cults of these creatures will have 1d6 2nd level witches with a 5th or better leader who will gain personal visions during the full moon & can curse 1d4 victims each new moon. These cults operate with 1d20 agents throughout an area who may or may not know what or whom they are spying or doing dirty tricks for. The inner rites of the cult involve the summoning of ghosts or the damned souls of familial members of the cult. These are often ancient ancestors or royals whose advice to the living will sew the seeds of chaos & murder. This summoning can be done during the last phases of the moon but a commune with the dead spell can be done at any time. The Wayward sisters specialize in the destabilization of royal reigns & bloodlines often through advising the rulers or kings of looming disaster or threats to the crown. Prophetic dreams or visions are often used to distract or sew seeds of discord in royal house holds leading to murders & suicides these are used as sacrifices to the moon goddess. Rulers often seek out the witches to lay curses upon rival rulers in times of peace or war leading to more chaos. Rich or poor souls do not matter to the sisters who see themselves as supernatural instruments of fate, chaos, & even death. They bare witness to all of the events from the astral plane even as they sew more discord across the countryside. These witches may be the remains of ancient pagan goddesses from the 'old faiths' of Earth & harbor a special favor for those who remember their ancient names. They may grant a small favor to one who knows them. Juicy pieces of royal gossip & scandal are met with favor. A mortal who tarries these witches favor with such a bloody piece of gossip will be granted a potion or some other minor item for such. But these items are often double edged swords. The witches are often sought out for their prophetic charms & dreams on royal children. This only allows the witches to have supernatural influence in the lives of such children. Once per week one of the witches may visit a particularly promising acolyte to give them a potion or minor charm to further the cult's aims. This of course is to further their own occult of agenda of chaos. Certain dungeon or adventure locations are watched over by the witches because of their supernatural importance. PCs may attract the attention of the witches much to their detriment. The witches are drawn to the scent of tragic events & violence as moths to the flames of a burning flame. They may 20% be compelled to give a shrieking prophetic & cryptic riddle or poem about some dark future event. 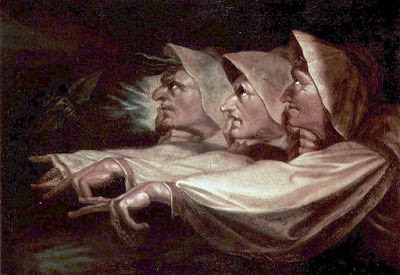 Shakespeare's witches have been inspiring writers & artists for centuries. This version was made for my Astonishing Swordsmen & Sorcerers of Hyperborea rpg adventure using the alternative historical Dark Albion & Dark Albion Cults of Chaos setting rules. 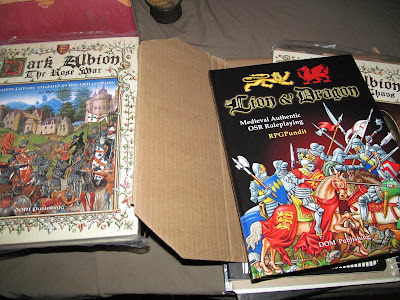 Bits & pieces were taken from Lion & Dragon as well.